A digital force gauge, often called a push pull force gauge or tension and compression force gauge, is used in material testing, quality control and assurance, research, development, product testing, laboratory and educational applications. PCE Instruments' (PCE) digital force gauge products are the benchmark of quality and performance. PCE digital force gauge devices provide measurements in kilograms (kg), grams (g), ounces (oz), pounds (lbs) and Newtons (N) of force (f), depending on the force gauge model. Most PCE digital force gauge products are handheld, portable devices that also can be used with a universal test stand. There are several different force gauge products available online in the PCE web shop. A force gauge with a capacity up to 1000 g typically has a clamp attachment to support the load, while a force gauge with a capacity up to 50 kg typically has a hook attachment. Most force measuring devices with capacities up to 100 kg and beyond have heavy-duty carabiner-style attachments as load supports. When using a force gauge, measuring with a compression kit can quickly and easily convert a tension meter into a compression meter. At PCE, we offer mechanical force gauge products as well as digital force gauge devices. Most digital force gauge devices are available with RS-232 or USB ports or interfaces. Optional software allows for data to be transferred to a computer for analysis. Why measure force? Manufacturers strive to optimize their materials, products and processes to achieve maximum performance and safety with minimal cost. To find the right manufacturing mix, many manufacturers put their materials and products to the test. This kind of testing often involves the use of a force gauge to determine under what conditions a material, component or product could break or become loose. A force gauge can be used to identify the amount of Newtons necessary to a open door, turn a handle or push down a vehicle's brake pedal. Force gauges can measure tension forces used to destroy metal pipes or wires. Force gauges even can be used to evaluate how compression forces affect car seats during an automobile accident. Check out our free force gauge unit converter here. Our handy force gauge unit converter enables you to convert the measurement data you have collected into units such as ponds (p), Newtons (N), kiloponds (kp) or kilograms-force (kgf), kilonewtons (kN), dynes (dyn), poundals (pdl), ounces-force (ozf) and pounds-force (lbf). The force gauge PCE-FM 200 is a handheld device that measures up to 200 N. The force gauge PCE-FM 200 can determine the units N, kg and lb. The PCE-FM 200 force gauge is supplied with various adapters that have different shapes. The force gauge PCE-FM 200 can measure both tensile and compressive forces. The PCE-FM 500N force gauge is a microprocessor controlled dynamometer with fast and accurate readout of tensile and compressive forces in N, Kg and lb. The display of the force gauge is easily readable by the large numbers. 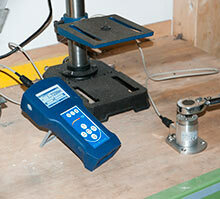 The force gauge is equipped with an internal load cell for tensile and compression tests. This force gauge is a tensile / compressive force gauge. This traction / compression force gauge has an internal load cell. 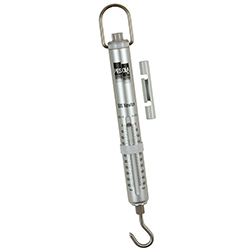 It is a portable traction / compression force gauge that can be installed in a force measurement stand. The PCE-PTR 200N force gauge is a hand-held device up to 200 N. The PCE-PTR 200N force gauge can determine the units N, kg and lb. The PCE-PTR 200N force gauge comes with various shaped adapters. With the PCE-PTR 200N force gauge both tensile and compressive forces can be measured. The force gauge PCE-FM 200 is a handheld device that measures up to 200 N. The force gauge PCE-FM 200 can determine the units N, kg and lb. The PCE-FM 200 force gauge is supplied with various adapters that have different shapes. The force gauge PCE-FM 200 can measure both tensile and compressive forces. This force gauge comes with an ISO calibration certificate (PCE-FM 200-ICA). The PCE-DDM 3WI Force Gauge is the ideal tool for measuring strong tensile forces. The PCE-DDM 3WI Force Gauge is delivered in a protective carrying case and includes two shackles made of heavy-duty aluminum. The instrument is manufacturer calibrated, but can be certified to ISO standards for an additional fee. The PCE-DDM 5WI Force Gauge is the ideal tool for weighing big loads and for measuring strong tensile forces. The PCE-DDM 5WI Force Gauge is delivered in a protective carrying case and includes two shackles made of heavy-duty aluminum. The instrument is manufacturer calibrated, but can be certified to ISO standards for an additional fee. Digital force gauge PCE-DFG N 10 for tensile force measurement and force measurement up to 10 N. The PCE-DFG N 10 is a digital dynamometer for precise measurements with a resolution of 0.005 N. The Force gauge PCE-DFG N 10 can be purchased here in our shop. Digital force gauge PCE-DFG N 20 for tensile force measurement and force measurement up to 20 N. The PCE-DFG N 20 is a digital dynamometer for precise measurements with a resolution of 0.01 N. The force gauge PCE-DFG N 20 can be found here in our shop to buy. Digital force gauge PCE-DFG N 200 for tensile force measurement and pressure force measurement up to 200 N. The PCE-DFG N 200 is a digital dynamometer for precise measurements with a resolution of 0.1 N. The Force gauge PCE-DFG N 200 can be found here in our shop to buy. Force Gauge PCE-DFG N 5 for tensile force measurement and force measurement up to 5 N. The PCE-DFG N 5 is a digital dynamometer for precise measurements with a resolution of 0.001 N. The Force Gauge PCE-DFG N 5 can be purchased here in our shop. Digital force gauge PCE-DFG N 500 for tensile force measurement and pressure force measurement up to 500 N. The PCE-DFG N 500 is a digital force gauge PCE-DFG N 500 for precise measurements with a resolution of 0.1 N.
The PCE-DDM 3 Force Gauge is the ideal tool for measuring strong tensile forces. The PCE-DDM 3 Force Gauge is delivered in a protective carrying case and includes two shackles made of heavy-duty aluminum. The instrument is manufacturer calibrated, but can be certified to ISO standards for an additional fee. The PCE-DDM 5 Force Gauge is the ideal tool for weighing big loads and for measuring strong tensile forces. The PCE-DDM 5 Force Gauge is delivered in a protective carrying case and includes two shackles made of heavy-duty aluminum. The instrument is manufacturer calibrated, but can be certified to ISO standards for an additional fee. The PCE-DFG N 1K force gauge measures both tensile forces and compressive forces with very high resolution. The tensile force and the compressive force are often determined in the laboratory, for example, to determine the yield, the breakaway force, and the force required to push a button or switch. The PCE-DFG N 2.5K force gauge measures both tensile forces and compressive forces with very high resolution. The tensile force and the compressive force are often determined in the laboratory, for example, to determine the yield, the breakaway force, the force required to push a button or switch. You can buy the force gauge PCE-DFG N 2.5K here in our online shop. The force gauge PCE DFG N 5K measures both tensile and compressive forces with a very high resolution. The tensile force and the compressive force are often determined in the laboratory, for example, to determine the yield, the breakaway force, and the force required to push a button or switch. You can buy the force gauge PCE-DFG N 5K here in our online shop. The PCE-DDM 10WI Force Gauge is the ideal tool for weighing big loads and for measuring strong tensile forces. The PCE-DDM 10WI Force Gauge is delivered in a protective carrying case and includes two shackles made of heavy-duty aluminum. The instrument is manufacturer calibrated, but can be certified to ISO standards for an additional fee. The PCE-DFG N 10K force gauge measures both tensile and compressive forces with very high resolution. The tensile force and the compressive force are often determined in the laboratory, for example, to determine the yield, the breakaway force, and the force required to push a button or switch. You can buy the force gauge PCE-DFG N 10K here in our online shop. For quick, easy and accurate force measurements, manufacturers rely on PCE’s force gauge products. A force gauge is a valuable tool used to measure product performance, safety and quality as well as compliance with industry standards. A force gauge also is used to evaluate the physical and mechanical properties of raw materials and components during product research, development, design, manufacturing, production and assembly. Thus, a force gauge has many uses including but not limited to testing of plastics, packaging, paper, medical devices, electronics, fabric, textiles, springs, wires, electrodes, welds, metals and material composites. How do you determine what force gauge is best suited to your application? The following text is designed to help you make an informed purchasing decision. 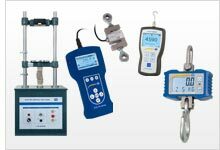 - What type of force testing system does your application require (e.g., portable handheld force gauge or force gauge with stationary force test stand or universal testing machine)? - What type of force need to be measured (e.g., compression, tension, torque, peel strength, flexure / bend strength, etc.)? - What is the anticipated minimum and maximum force to be measured (e.g., force measuring range of 0 ... 500 N)? 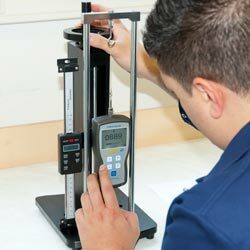 - What degree of accuracy is necessary for the successful completion of your force testing task? Following is a more detailed analysis of criteria to keep in mind when selecting a force gauge. The answer to this question largely depends on the intended application. If you want to use the force gauge to sporadically collect readings for quality assurance, a portable force testing device should be used. If you want a more precise and repeatable force test, it will be better to use a stationary force test stand with your force gauge. In addition to providing stability, a stationary force test stand, also called a universal testing machine (UTM), can be equipped with an RS-232 interface or USB port, allowing the test stand to be controlled by a computer. When selecting a force gauge, one must consider how the force is initiated. Tension is the pulling force, whereas compression is the pushing force. Both tension and compression are common forces measured by a force gauge. When testing peel strength, the force is initiated by adhesion. Flexure / bend strength is a test performed primarily on coatings to assess formability, ductility and elongation. Another common force measurement is torque. Torque is the force initiated by rotation. For torque measuring instruments, visit torque meters / torque testers. For safety reasons, you must choose a force gauge that accommodates the maximum force to be measured. Then, a buffer should possibly be taken into account, if the required measuring accuracy permits it. In addition, hazards that may arise during the force measurement should be determined and eliminated accordingly beforehand. For example, if during a tensile force measurement, there is a risk that the test material could get twisted, the force measuring device must be secured by means of a clamp to prevent injury. For applications requiring minimal force, a simple and cost-effective force measuring device is a spring scale. A spring scale measures weight or force, typically in grams (g), kilograms (kg), pounds (lbs) and / or Newtons (N), when an object is hung from the hook of the scale. 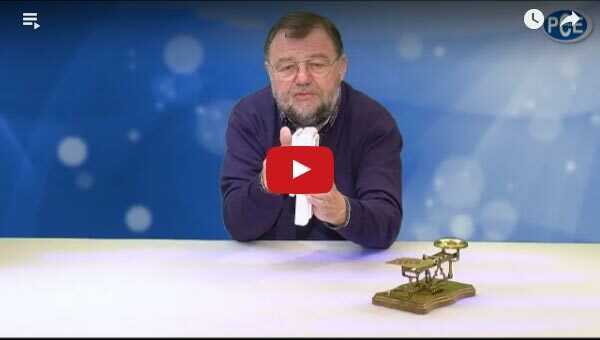 Also called a spring balance, this mechanical force measuring device is ideal for physics force experiments and for teaching action-reaction in science, technology, engineering and math (STEM) classrooms and other educational settings. During measurement, the spring installed in the scale is extended or pulled. When released, the spring returns to its original state. Another force measuring device with a mechanical measuring principle is a hydraulic force gauge. A hydraulic force gauge uses a hydraulic liquid to measure acting forces. Hydraulic force sensors are designed for much larger force measuring ranges in comparison to spring scales. However, the disadvantages of hydraulic force gauge devices are lower measuring accuracy, lower measuring resolution and lack of measurement traceability. For these reasons, digital force gauge devices are predominantly used. A digital force gauge consists of two important components: the sensor and the meter or evaluation unit. In digital force gauge devices with lower measuring ranges, the sensor is often installed internally. For larger measuring ranges, the sensor is connected externally to the meter. Many digital force gauge products are multi-purpose and will measure both tension and compression forces, among other parameters such as rotation speed and triaxle vibration. There is no one sensor that could be suitable for all measurement tasks. Thus, these multi-purpose digital force gauge devices will often come with adapters and / or be programmed to perform mathematical measurement conversions. 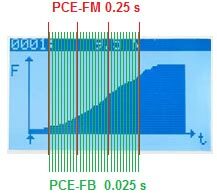 An important parameter for a digital force gauge is the maximum possible sampling rate. Sampling rate is the frequency with which the transmitter checks the force sensor. It is often indicated as an Hz number. 1000 Hz means that the force sensor is queried 1000 times per second by the transmitter, and the transmitter is able to change the measurement data 1000 times per second. Low cost force gauges have only one sampling rate of 2 Hz which is sufficient for a slow force measurement but is definitely unsuitable for a tear test. Because of the slow reaction, many measurement data of the force influence during the tear test are lost and that is why are not meaningful. The user is not able to process an enormous amount of data (1 kHz = 1000 Hz = 1000 values per second) during the measurement. So, here it also must be considered whether the evaluation system / transmitter is able to provide the user in any form with 1000 values. Thus, the measurement data can subsequently be evaluated individually. Some low cost transmitters of the force measurement can query the sensor, e.g. 1000 times, but are not able to provide the user with the data sufficiently and in the fullness, since the processing electronics is unable to process the measurement data at that speed. Then, the average values are calculated which are then passed further. Another popular, albeit expensive, force measuring tool is a highly flexible resistance strain gauge (DMS). A DMIS is a thin film to which a wire pattern or measurement grid is adhered. This wire is supplied by an external voltage and changes the resistance or conductivity due to expansions and compressions. This change is so far proportional and reproducible that an external evaluation indicator can carry out the calculations of the force. These DMS films are then attached (glued) to the measuring points where the deformation can be recorded with the help of the measuring grid. However, it must still be taken into account that there are other influencing factors such as temperature, humidity, magnetic fields, etc., that can affect the conductivity and thus distort the readings. Just as in the finished force sensors the DMS films are easily placed at those places of the construction where the force exerts the greatest deformation. However, it must, by all means, be considered, that the DMS strips must have a fixed connection to the ground so that to give the deformation further. Thus DMS strips cannot be used again after they have been glued once. The higher the maximum load of the sensor, the lower the measuring accuracy of the sensor. Thus, a compromise should be reached here. Each force gauge will have its own accuracy specifications that are dependent upon the range being measured. Typically a higher accuracy measuring instrument will come with a higher price tag, so it is important to consider practicality as well as precision. Whether for a long-term or for a short-term measurement, in both cases, the data analysis is elementary. The data can be processed due to the special functions of the evaluation system / transmitter and provided to the user. If the user wants to determine, e.g., only the maximum force, the transmitter can present the highest value in the form of PEAK or MAX from the collected data (note sampling rate) and filter out the other readings. If the user still wants to determine the other reading such as, e.g., the average value, then possibly another function and filters are necessary. In the best case, the whole collected measurement values after the force test can be stored. These raw files allow even later to determine the desired results from the already carried out measurement experiments. So there is an evaluation system / transmitter from the force measurement which stores the measurement data in the internal memory and can provide the data to the user after the measurement. Another way to save the measured data is to transfer the data to a storage device such as a PC or data logger using an RS-232, USB, 4-20 mA or 0-10 V interface. This is another important point to keep in mind. Find out how long the supplier has been in business. The longer the company's tenure, the more likely it is that you will be able to order spare parts a few years down the road after buying your force gauge. PCE Instruments has been in business since 1999. (For more details, please visit the About Us / Corporate History section of our website.) Also find out what kind of technical support will be available to you. Call PCE Instruments, talk to the technical support team prior to purchasing and see for yourself the level of service provided. Often more is involved in the budget than just the cost of the force gauge. Calibration costs are common expenses that can occur when using a force gauge. For instance, if you need to meet the requirements of an ISO quality standard, a regular calibration interval needs to be adhered to. ISO calibration costs can occur at the time of purchase and reoccur on an annual or even semi-annual basis, depending on your accuracy needs and usage of the force gauge. It is also possible that recalibration becomes necessary later on, due to the drift that sensors can experience over time. Consumables like (rechargeable) batteries should be included in your calculations as well. For robust weighing equipment, please visit the crane scales and heavy-duty scales sections of the PCE Instruments website.